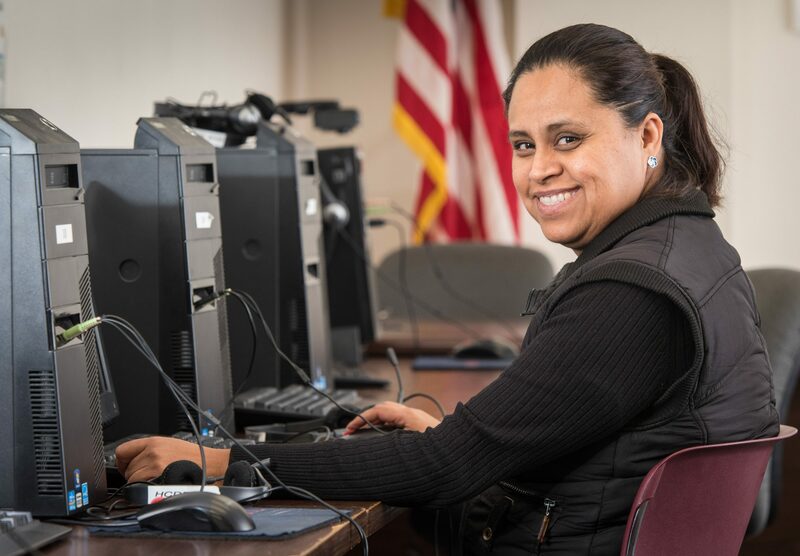 Native Spanish speaker Liliana Martinez began learning English online six months before she walked into her adult learner classroom at Harris County Department of Education (HCDE) in northeast Houston. A Texas Workforce Commission (TWC) grant of $174,798 recently awarded to HCDE Adult Education will give almost 3,000 additional students like her the opportunity and convenience of learning in their own space at their own pace. The grant expands distance learning opportunities, virtual learning which can be accessed at home, on portable devices or through a public computer connection such as the library. Learning scenarios include using distance learning alone or combining it with traditional face-to-face classes as reinforcement. Martinez, an immigrant from Michoacán, Mexico, came to America with a green card five years ago. Long work hours kept her from going to school. When she did go to class, she fell asleep due to exhaustion. “I knew I wanted to study and improve my life, so I needed to learn,” she said. After her work schedule became less hectic, Martinez contacted HCDE Adult Education and learned about the distance learning program. She decided to try it and committed to studying English online for five hours a week while she was wait-listed to begin free GED classes. Six months later, Martinez retested for her English comprehension level and was accelerated to the ESL advanced level. Since September, she has been studying for the GED exam and will soon take the high school equivalency tests. Students use online curricula for multiple levels of ESL, adult basic education for reading and writing, and advanced adult education for GED preparation. Software used includes GED Academy, USA Learns, Burlington English and Sed de Saber. According to the TWC, students who engage in distance learning along with traditional learning outperform students who solely rely on classroom learning. In 2016-2017, 13,545 adults statewide engaged in distance learning. Of those, 60 percent completed one or more education levels, compared to 40 percent who did not participate. Despite the favorable statistics, only 15 percent of all adult education students were utilizing distance learning. TWC is working to introduce more adult learners to the benefits of distance learning models. Martinez still likes the option of reinforcing her classroom learning with online learning. At 37, Martinez is glad she decided to take advantage of online learning before entering the classroom.